Disclosure: I was provided a free week of camp (which we were unable to use) in exchange for my honest review. All thoughts and opinions are my own. After a fun season of spring soccer which ended with an awesome tournament for Rebekah, we were looking forward to an end of June British Soccer Camp. Unfortunately, life gets in the way and we will not be able to participate this year after all. But, both Rebekah and I had so many good memories from last year's camp that we wanted to share them with you. Camps are located all around the country - check out the dates and locations here. And if you enroll using the code USFG16, you will receive a free water bottle. The rules for the scrimmage were so inclusive the kids didn't realize it was to make sure nobody was hogging the ball and every child had the chance to dribble, pass and shoot. To see the full 2015 Week in Review (including photos of camp), please click here. We are very disappointed that our schedule won't allow us to do the camp this year. 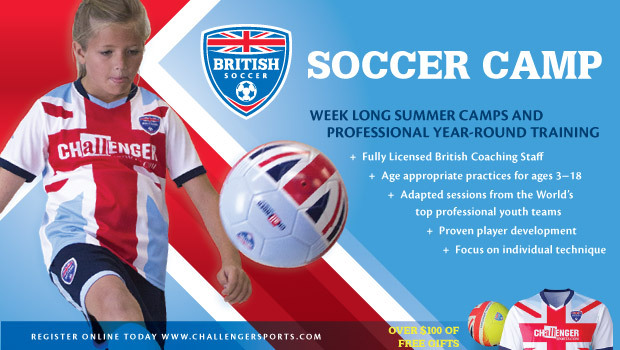 I'm hoping others of you with children who like soccer will take advantage of the opportunity to expand your child's horizons by attending a British Soccer Camp near you.